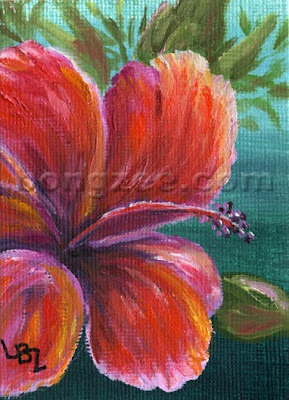 Here is the third in my teeny tiny Hibiscus series. I'm having a lot of fun with these! Second in my teeny tiny Hibiscus series. 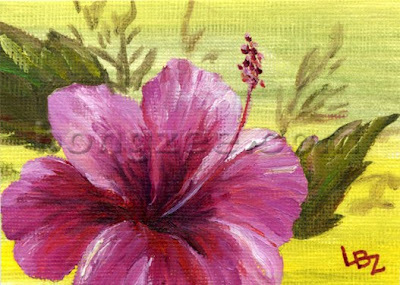 The first in my teeny tiny Hibiscus series. 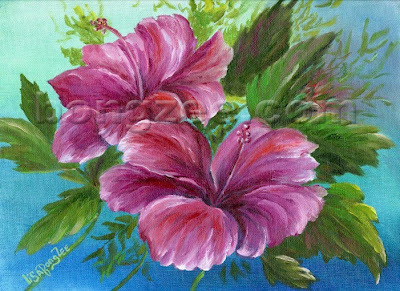 I've decided to change up my subject matter this week, and went from landscapes, to painting the beautiful Hibiscus that are blooming in my garden. They are fun to paint, and I love the delicate ruffly petals. 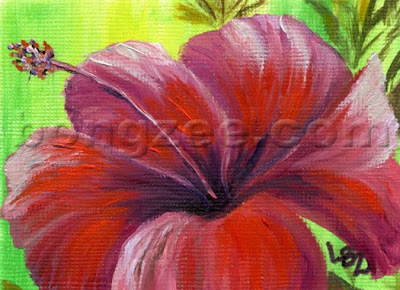 Here is one of my finished Hibiscus... more to come! Somewhere out there lies a hidden Paradise with crystal clear warm turquoise waters, waves lapping gently to the shore, and the light breeze rustling through the palms. With the exception of a few migratory seabirds stopping by for a quick break before moving on, the place is yours, and yours alone to enjoy completely. is a triptych measuring 33 x 14. It consists of three 11x14x3/4 gallery wrapped canvases. They have been painted on all edges, so no need for a frame.